NDB Cluster supports asynchronous replication, more usually referred to simply as “replication”. This section explains how to set up and manage a configuration in which one group of computers operating as an NDB Cluster replicates to a second computer or group of computers. We assume some familiarity on the part of the reader with standard MySQL replication as discussed elsewhere in this Manual. (See Chapter 16, Replication). NDB Cluster does not support replication using GTIDs; semisynchronous replication is also not supported by the NDB storage engine. In this scenario, the replication process is one in which successive states of a master cluster are logged and saved to a slave cluster. This process is accomplished by a special thread known as the NDB binary log injector thread, which runs on each MySQL server and produces a binary log (binlog). This thread ensures that all changes in the cluster producing the binary log—and not just those changes that are effected through the MySQL Server—are inserted into the binary log with the correct serialization order. We refer to the MySQL replication master and replication slave servers as replication servers or replication nodes, and the data flow or line of communication between them as a replication channel. For information about performing point-in-time recovery with NDB Cluster and NDB Cluster Replication, see Section 21.6.9.2, “Point-In-Time Recovery Using NDB Cluster Replication”. NDB API _slave status variables. NDB API counters can provide enhanced monitoring capabilities on NDB Cluster replication slaves. These are implemented as NDB statistics _slave status variables, as seen in the output of SHOW STATUS, or in the results of queries against the SESSION_STATUS or GLOBAL_STATUS table in a mysql client session connected to a MySQL Server that is acting as a slave in NDB Cluster Replication. By comparing the values of these status variables before and after the execution of statements affecting replicated NDB tables, you can observe the corresponding actions taken on the NDB API level by the slave, which can be useful when monitoring or troubleshooting NDB Cluster Replication. Section 21.5.17, “NDB API Statistics Counters and Variables”, provides additional information. Replication from NDB to non-NDB tables. 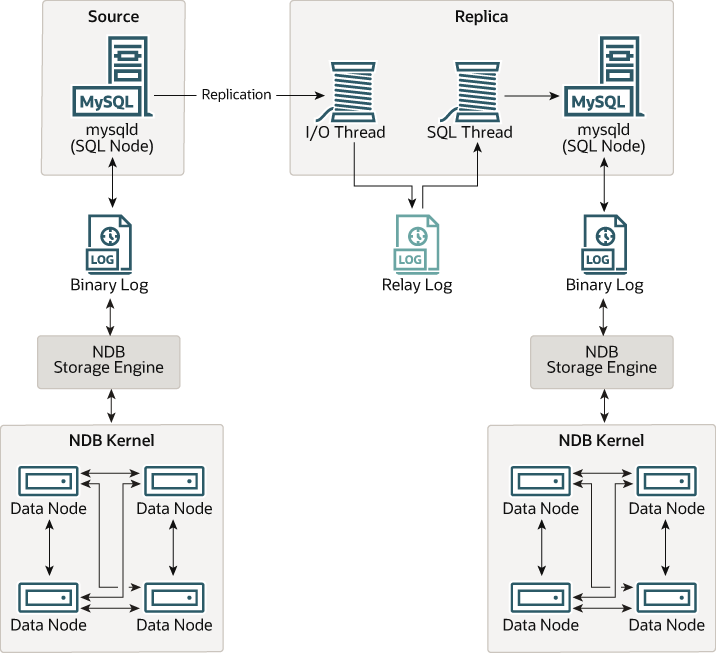 It is possible to replicate NDB tables from an NDB Cluster acting as the master to tables using other MySQL storage engines such as InnoDB or MyISAM on a slave mysqld. This is subject to a number of conditions; see Replication from NDB to other storage engines, and Replication from NDB to a nontransactional storage engine, for more information.